John Berggruen Gallery is pleased to present an exhibition of eight contemporary artists Tauba Auerbach, McArthur Binion, Troy Brauntuch, Thomas Eggerer, Charline von Heyl Suzanne McClelland, Sarah Morris, and Josh Tonsfeldt. 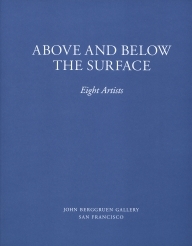 Eight Artists examines the unique and in many cases sensitive handling of the painted surface by each artist included in the exhibition. John Berggruen Gallery will host an opening reception on Thursday, February 6th from 5:30 – 7:30 pm. Tauba Auerbach (b. 1981 San Francisco, CA) has described her work as an attempt to reveal “new spectral and dimensional richness…both within and beyond the limits of perception." In her Fold paintings, Auerbach presents powdery trompe l’oeil surfaces that register the traces of their former three-dimensionality. Auerbach's work has been included in several notable museum exhibitions, including the Museum of Modern Art, New York, the Museum of Contemporary Art, Los Angeles, and the 2010 Whitney Biennial. She received SFMOMA's Society of Contemporary Art's SECA award in 2008. McArthur Binion (b. 1946 Macon, MS) does beautiful cross-hatched, multi-media surfaces that read as paintings. Decidedly minimal, Binion’s work embodies a strong intellect rooted in the expressive capabilities of color and abstraction. He cites his work’s narrative in the use of his hands to make his paintings, and his choice of child-like materials – wax crayons – which he presses onto shaped panels. The use of the crayon as medium renders a critique to the history of painting the ability to transform the ordinary “child’s medium” into a tool that can render complex studies of color and light. Binion’s work is in numerous private and public collections including the Metropolitan Museum of Art, New York and the Detroit Institute of Art. He is currently a Professor of Art at Columbia College in Chicago. Troy Brauntuch (b. 1954 Jersey City, NJ) along with Robert Longo and Cindy Sherman is one of the most important exponents of the Pictures Generation of the late 70s. Drawing from images found in newspaper, magazines, and some he has taken himself, he erases what is recognizable about them by reproducing them with crayon onto dark cotton canvases. As the largely everyday motifs – an evening gown, a glove – gradually emerge from the dark surface of the canvas they take on a beautiful and haunting psychological weight. Brauntuch was included in the 2005 Whitney Biennial, and his work is in numerous public collections, including the Metropolitan Museum of Art, New York; Museum of Modern Art, New York; the Hirshhorn Museum and Sculpture Garden, Washington, D.C; SFMOMA. In 2010 he was awarded Guggenheim Fellowship award. Thomas Eggerer (b. 1963 Munich) blends abstract and figurative imagery in vivid, dreamlike fields of color. His new canvases, all of them large-scale, build on his signature approach with figures rendered within otherworldly realms, absorbed in their actions that remain rather mysterious. His figures, with undefined faces and broadly applied forms, are more anonymous than individual, cast in candied colored planes of abstraction. Eggerer’s work is in a number of public collections including the Museum of Modern Art, New York, MOCA, Los Angeles, and SFMOMA. Charline von Heyl (b.1960 Mainz, Germany) creates dissonant, enigmatic canvases, constantly pushing painting in compelling new directions. While she draws inspiration from tangible objects or images, von Heyl’s paintings are not representations of real things in the world. 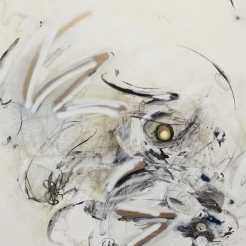 They are an assemblage of abstractions she discovers while improvising, adding and building on her canvas. The artist says it is her way of “combining things that don’t want to go together until they make a new image.” Von Heyl’ work has been included in many notable museum exhibitions including Museum of Modern Art, New York, Museum of Contemporary Art Chicago, Chicago, and the UCLA Hammer Museum. Her work is in several public collections including MOCA, Los Angeles, SFMOMA, and Tate, London. Suzanne McClelland (b. 1959 Jacksonville, FL) paintings are best known for their genesis in textual elements incorporated into dramatic abstract compositions. She renders words and numbers with wiry, energetic, splashes of paint and scrape giving physicality to language. McClelland’s constellations of ciphers evoke the sound of speech while at the same time, her repetition of a single word creates a highly personal poetry about the shifting, often elusive nature of meaning. Her work is in a number of public collections including the Metropolitan Museum of Art, New York; Museum of Modern Art, New York; Walker Art Center, Minneapolis. McClelland’s work will also be included in the 2014 Whitney Biennial. Sarah Morris (b. 1967 London) is an internationally recognized painter and filmmaker, known for her complex abstractions, which play with architecture and the psychology of urban environments. Her canvases are smoothly reflective surfaces made up of elegant color combinations whose curves, vectors and interlocking formations reference a way of perception and speak to her exploration of the built environment. Morris’ work has been included in several important exhibitions including the 25th Bienal de São Paulo, and the Tate Triennel. Her work is in a number of public collections including the Centre Pompidou, Paris, Solomon R. Guggenheim Museum, New York, and the Tate Modern, London. Josh Tonsfeldt (b. 1979 Independence, MO) has a storyteller- meets- archeologist's sensibility. They are part of a series that relate to his visiting his Grandparents farm as the family ceased to own it, and then collecting fragments and notes and photos that are then incorporated into beautiful crusty "paintings" on paper with these remnants, bits of memory and sometimes script, included in, or hidden below, the surface. He has also cast partial architectural elements of the now deserted buildings. Tonsfeldt lives and works in New York and has been exhibited recently in group shows such as ‘Nina in Position’ at Artists Space, New York and ‘Hermann’s Grid” at Franco Soffiantino in Turin, Italy.